As a kid, I was lucky to have had many oppurtunities to experience long road trips through the heart of southern india – the bustling commercialism of the Bangalore – Chennai route; the shimmering heat haze and inviting canals on the Coimbatore – Bangalore route; or the seemingly never-ending villages on a road journey through the length of Kerala. In all these trips, certain things always seemed constant – weatherbeaten brick houses dwarfed by the big Indian sky; thier walls painted with fading advertisments for forgotten brands of cement and bicycles. Or fields of low bushes and trees, framed by low hills in the distance. 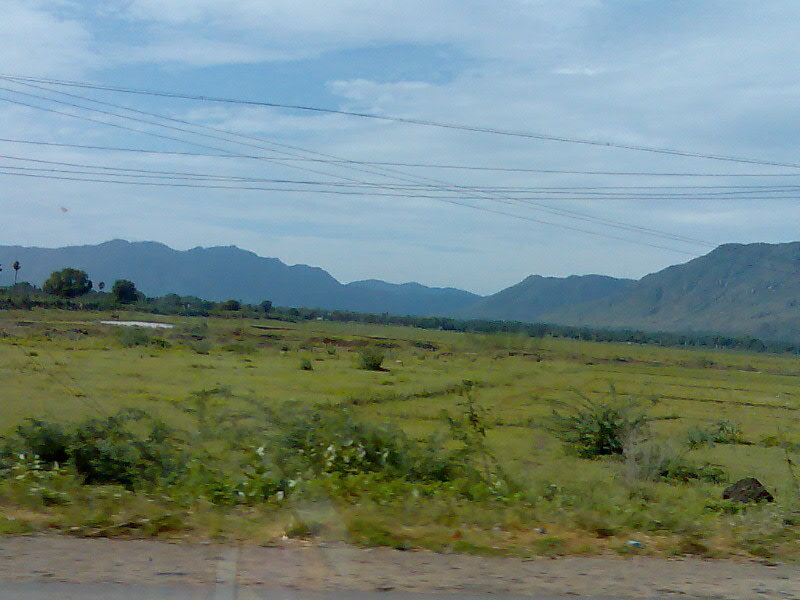 During this year’s annual vacation to India, I had the oppurtunity to relive one of of those road trips – on the new “Old Road” between Chennai and Bangalore. – Giant factories still under construction, hinting at even more astonishing development, slowly creeping out into the hinterland of Tamil Nadu. It seems the ripples from India’s 15-odd years of liberalization has yet to spread beyond its cities – the rural landscapes of India remain much the way they were when Manmohan Singh first threw open the gates for FDI in India. The sentimental part of me takes comfort in the fact that the happy memories of my childhood are undiluted. Another part of me wonders when exactly will most of India actually feel the benefits of the “economic miracle” that educated, white collar India has ridden to new heights? 2 Responses to "Exactly like I remember it – and that’s a bad thing"
The scenery almost look alike somewhere in Kedah, Malaysia at my first sight. I agree with you though :). In my road trips thru Malaysia, I’ve always been reminded of travelling through parts of India!